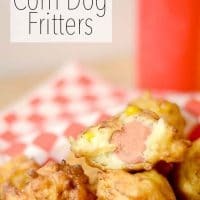 Corn dog fritters are fluffy little bites of goodness! The cream of corn and extra fine cornmeal make these appetizers so delicious. They are like a mini corndog, but even better with little bits of corn in the batter. Plus, they are easy to eat with your hands or serve them up with mini forks/toothpicks. I’ve tried different recipes for making corn dogs throughout the years and they are hard to get just right. Trying to fry a corndog with the stick is the biggest problem I have. I decided that this time I would try out corn dogs without a stick and make them into little fritters. These corn dog fritters are so quick and easy to make. We love how these turned out! We like to serve our corn dog fritters with a little ketchup and mustard on the side. I am sure you could come up with some other tasty condiments to go with these as well. I think a sweet sauce like honey mustard would be super yummy too! I’ve even thought about putting a little powdered sugar on top for a salty/sweet combo. 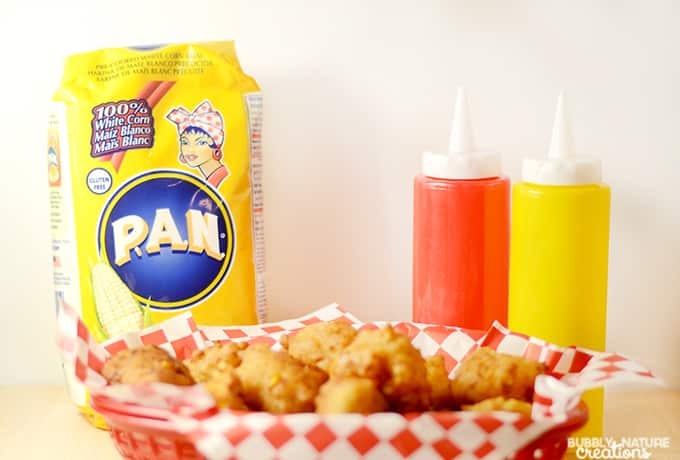 One of the key ingredients I used in these corn dog fritters is P.A.N cornmeal. P.A.N. cornmeal is the number one cornmeal in South America, but is recently making it’s way into kitchens in North America. I love the texture and taste the cornmeal gives these fritters. It has a different texture that regular cornmeal, but you can use the regular cornmeal in a pinch. I also love the nutrition and versatility of the P.A.N. cornmeal. I can use it in traditional recipes like the Corn Dog Fritters or in more exotic recipes from around the globe. 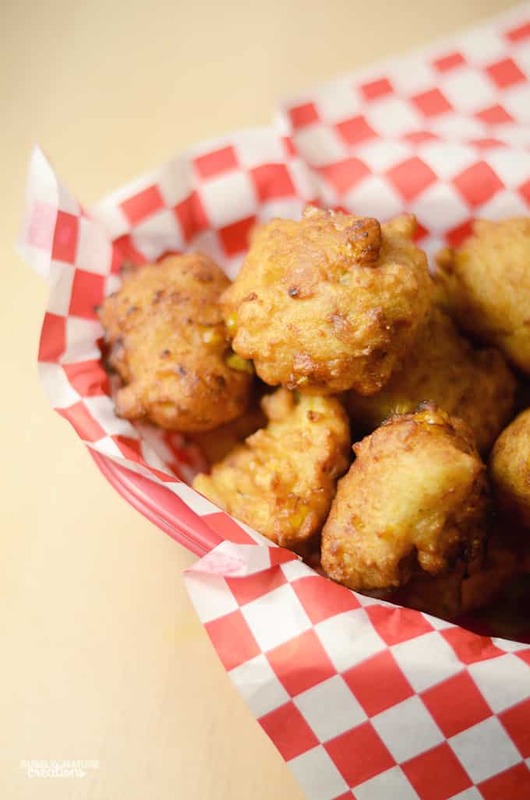 The cornmeal gives these corn dog fritters a unique texture and flavor. Cream of corn is the second ingredient I used that makes these divine. The cream of corn gives it a sweetness and provides the liquid part of the batter. Corn dog fritters are great to make for get-togethers and for parties! Serve them up easily with some toothpicks, mini sticks or if you can find them… mini forks (so cute). I think these would be cute on display with some more decorative toothpicks in them too. Give your guests little cups with ketchup or mustard and you’re set. Everyone will be coming back for more of these. These Corn Dog Fritters are soft and the added cream of corn really adds a tasty sweetness to them. You can even top them with a little powdered sugar for an even sweeter variety! Make sure they are not coated too thickly with the batter before frying or the middle may not cook all the way through. Just a thin layer of the batter is enough to make a fluffy corn dog fritter. Make sure the oil is hot enough, but within range. One of the trickiest parts of frying foods is the temperature of the oil you are cooking in. You’ll want to make sure to use an oil that can be used for high heat like peanut oil or vegetable oil. Then make sure the oil stays at the desired temperature. If the temp is too low the fritters will turn out soggy and too high they will burn around the outside and be raw on the inside. Coat the fritters with one layer only. 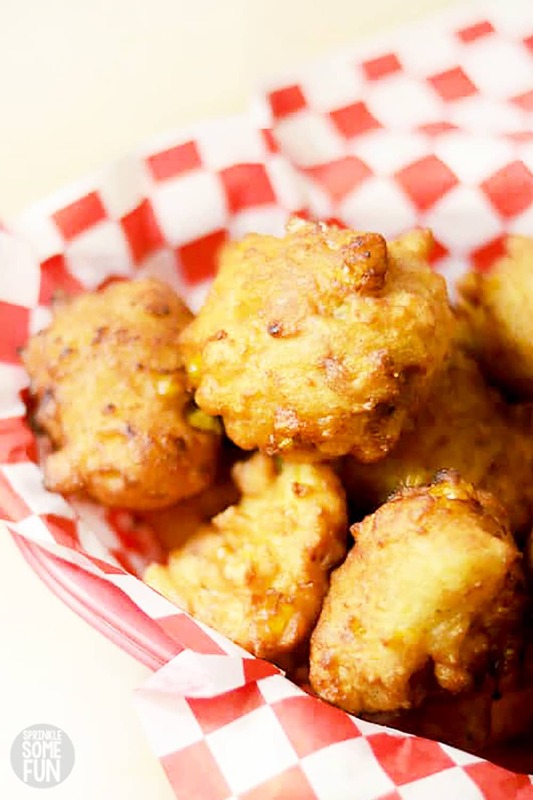 The batter for these corn dog fritters is going to puff up whenever you put them in the oil. Make sure to use a thin layer of batter for the best results. Additionally use beef hot dogs. I really think the beef tastes the best to make fritters with. We tried turkey hot dogs once and they were okay, but I will go back to the beef next time. Serve corn dog fritters immediately for best results. Corn dog fritters don’t keep well and so make sure to make them when you can serve them within 30 minutes. So if you are making these for a get-together keep that in mind. 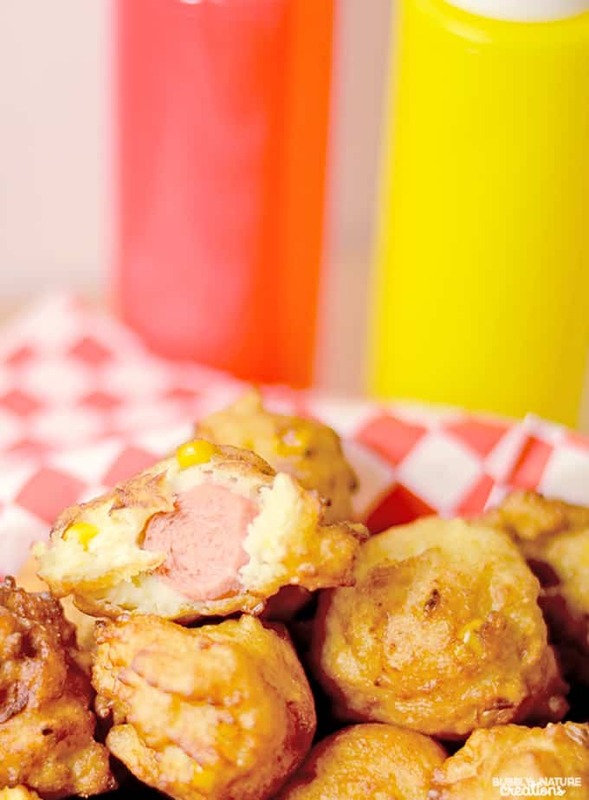 Lay corn dog fritters on a paper towel after frying. You’ll want to make sure that your corn dog fritters don’t get too much oil on them and so shake them off well and lay them to dry on a paper towel while you are making each batch. Sprinkle a little sugar or salt if you wish to the tops of them right after frying too. Lastly my suggestion is to use up all the batter. If you run out of hot dogs before you run out of batter the batter can be used to make corn fritters. Just fry them up by placing around a Tbsp. of the batter in the hot oil. I know I will be making these corn dog fritters again. I hope you enjoy this tasty recipe. 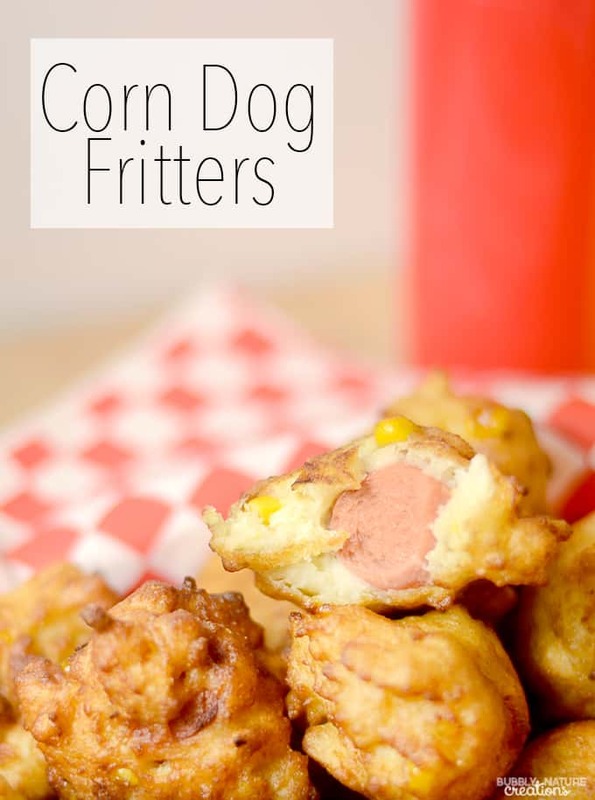 Have you tried this easy recipe and LOVE these corn dog fritters? If so, please leave us a 5 star review in the comments below. Heat fry oil to 350-375F. Mix dry ingredients in a medium sized bowl and mix wet ingredients in a separate medium sized bowl. Pour the wet ingredients into the dry ingredients and mix until batter is combined, but do not over-mix. Take the hot dog slices and coat them with the extra flour. Dip and roll hot dogs 1 at a time into batter and put them into fryer. Fry for around 3 to 5 minutes or until outside is golden brown. Take out of oil and shake off excess oil and serve. For a wide variety of recipes using P.A.N. 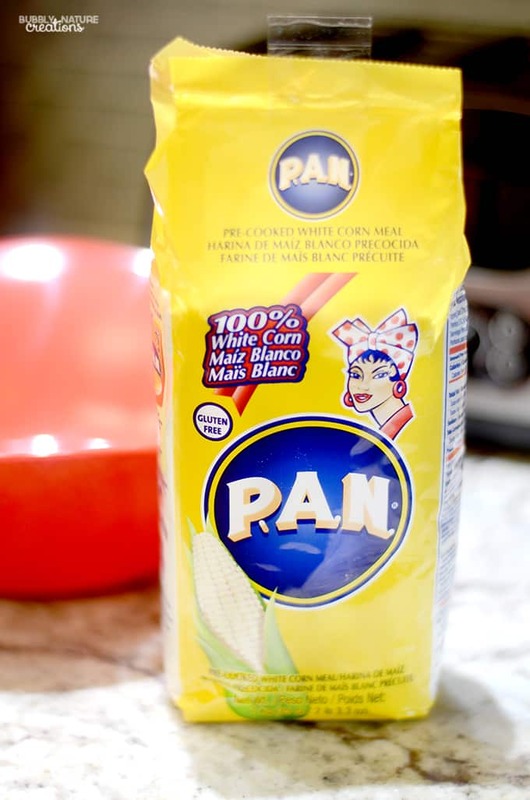 Cornmeal, visit the P.A.N. Tumblr page . I have never thought to put creamed corn in corn meal recipes.. sounds so yummy!!! 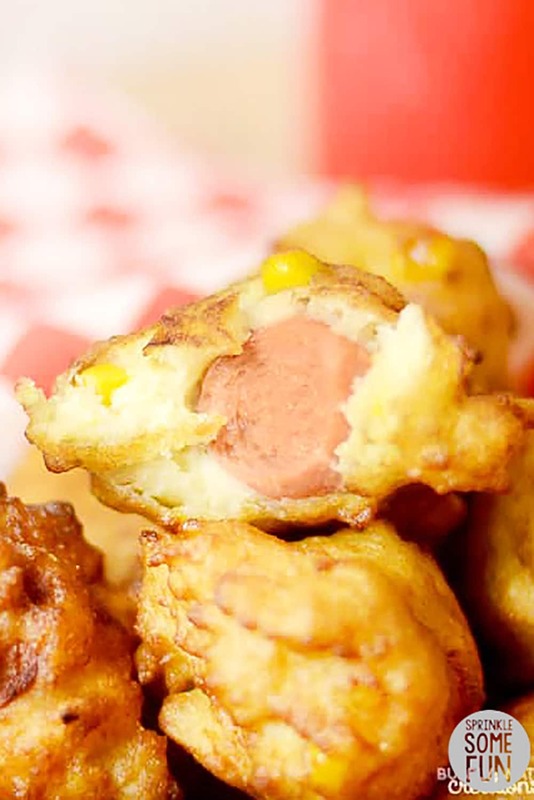 These corn dog fritters look and sound amazing! 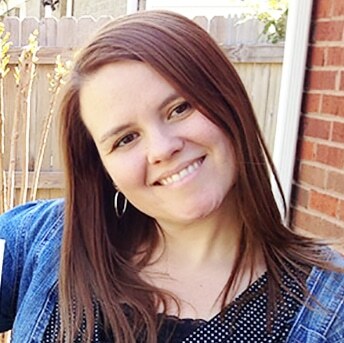 I’m with Vanessa – adding creamed corn to the batter is genius!